The pure-white ruffled flowers of Acoma crape myrtle trees contrast dramatically with the shiny green foliage. This hybrid is a small tree, thanks to one dwarf parent. 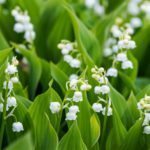 It’s also rounded, mounded and somewhat weeping, and makes a long-blooming vigorous beauty in the garden or backyard. 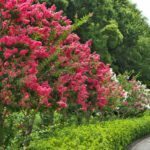 For more information about Acoma crape myrtle trees, read on. We’ll give you instructions on how to grow an Acoma crape myrtle as well as tips on Acoma crape myrtle care. Acoma crape myrtle trees (Lagerstroemia indica x fauriei ‘Acoma’) are hybrid trees with a semi-dwarf, semi-pendulous habit. They are filled with slightly drooping, snowy, showy flowers all summer long. These trees put on an attractive autumn display at the end of the summer. The foliage turns purple before it falls. Acoma only grows to about 9.5 feet (2.9 m.) tall and 11 feet (3.3 m.) wide. The trees usually have multiple trunks. This is why the trees can be wider than they are tall. Those growing Acoma crape myrtles find that they are relatively trouble free. When the Acoma cultivar came on the market in 1986, it was among the first mildew-resistant crape myrtles. It isn’t troubled by many insect pests either. 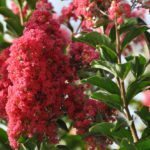 If you want to start growing Acoma crape myrtles, you’ll want to learn something about where to plant these trees. You’ll also need information on Acoma myrtle care. Acoma crape myrtle trees thrive in U.S. Department of Agriculture plant hardiness zones 7b through 9. 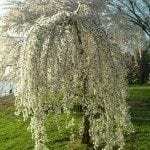 Plant this small tree in a site that gets full sun to encourage maximum flowering. It isn’t picky about soil types and can grow happily in any type of soil from a heavy loam to clay. It accepts a soil pH of 5.0–6.5. Acoma myrtle care includes ample irrigation the year the tree is first transplanted in your yard. After its root system is established, you can cut back on water. Growing Acoma crape myrtles does not necessarily include pruning. However, some gardeners thin lower branches to expose the lovely trunk. If you do prune, act in late winter or early spring before growth begins.